I’ve been looking for ways to get away from the page or screen with my writing, where it gets a bit precious and fiddly. Whilst in the Welsh hills, I thought I’d try out some ideas about text in landscapes. The results are below – it’s an interesting start but I’d love to get back out there and with some different materials and work at different scales. I used rolls of greaseproof paper for this, which was sturdy enough when wet, and pleasingly translucent under the water. It was too windy to try anything with the 16m poem I wrote out; this one-line piece was about 6m long and already quite unwieldy and fragile in the stiff mountain breeze. Pictures almost entirely by the ever-patient Timothy Bird. Previous Post Opera performance and a blog..
Great idea! 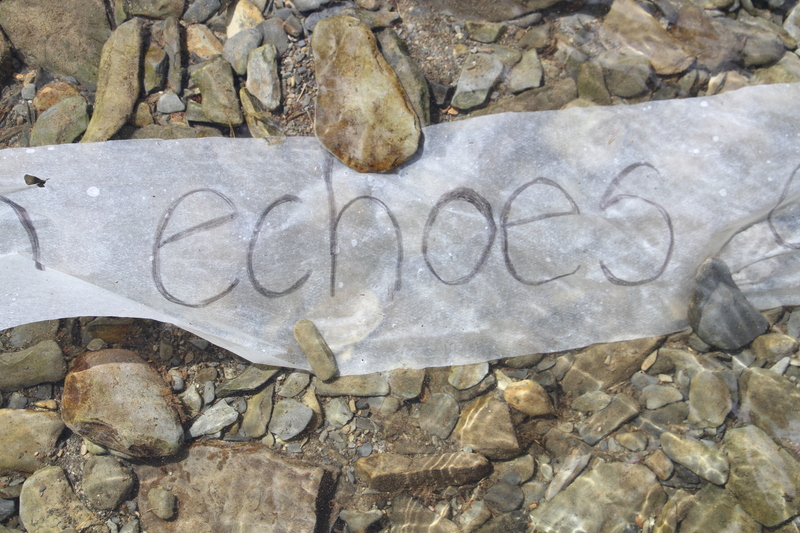 I love how the paper goes translucent in the water but the text stays strong.